Cincinnati’s federally-mandated and federally-funded transportation policy-making organization, Ohio-Kentucky-Indiana Regional Council of Governments (OKI), approved $4 million for the Cincinnati Streetcar project in May 2010. Now, OKI has unveiled a new video that discusses the highlights of the modern streetcar system and why it was the recipient of the money. The funds OKI approved came through the federal government’s Congestion Mitigation/Air Quality (CMAQ) program. At that time, the Cincinnati Streetcar project was the highest scoring of 14 total transportation projects being considered for the money. 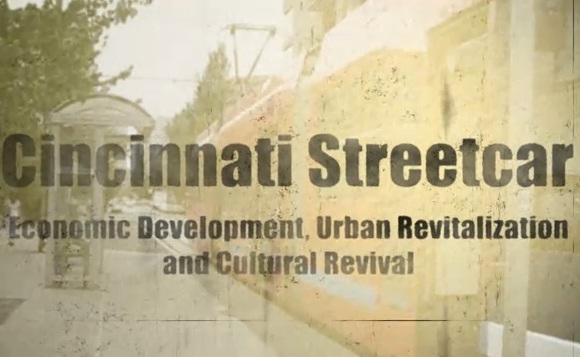 Within the video, OKI highlights the appeal of connecting the region’s two largest employment centers, encouring redevelopment of historic Over-the-Rhine and then further expanding the system so that it reaches other areas including Northern Kentucky. Cincinnatians For Progress will be hosting a kick off party and fundraiser at Grammer’s (map) tonight from 5:30pm to 8pm. The event will feature happy hour specials all night and is expected to have a large turnout of those interested in learning about how they can support the Cincinnati Streetcar and potential light rail transit in the region.